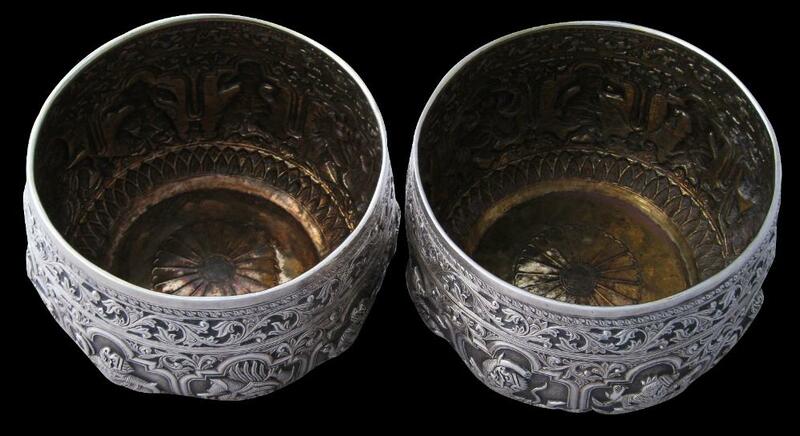 This pair of silver bowls are matching in every way. Both are repoussed and chased with nat spirits, demons and other figures from Burmese folklore. The lower border comprises a double row of upturned lotus petals, known as the kya-hlan motif. The upper border, much wider, comprises a scrolling orchid design known as the dha-zin-gwei motif. The form of the bowls precisely follows that of monks’ alms begging bowls. The interiors of both have a clear but beautifully patinated gold wash. The bases of each have an elegant chrysanthemum motif. The relief work is not as exuberant and distended as on pieces produced mainly for the export and colonial market. This pair appear to have been produced for local use and as such seem more traditional and restrained.